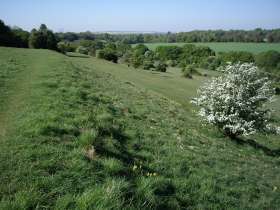 Traditional flower rich chalk downland with wildlife and archaeological interest set within a woodland fringe and with panoramic views to the south. Cattle grazing peacefully on Catherington Down and a Clouded Yellow butterfly photographed here on the Down on 8th August 2006. Catherington Down on 1st May 2007 with the hawthorn in full flower and cowslips dotted across the down. 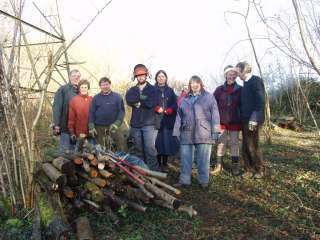 The day to day management of Catherington Down passed to Horndean Parish Council, Countryside Team in November 2004 working in conjunction with Hampshire Wildlife Trust. To see some of the flowers on Catherington Down, view the Biodiversity Wild Flowers page. There will be a working party on Catherington Down on Tuesday 21st Nov for more information see South Down Group page. 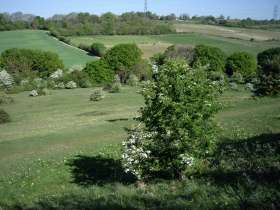 A wooded scarp with ancient semi natural woodland and a small area of chalk grassland on the lower slopes (Stubbins Down) providing a mix of habitats including coppice, high forest, butterfly meadows and pasture. Designated a Local Nature Reserve in 2001 and managed by the Horndean Countryside Team. Further details from Horndean Parish Council Countryside Team. 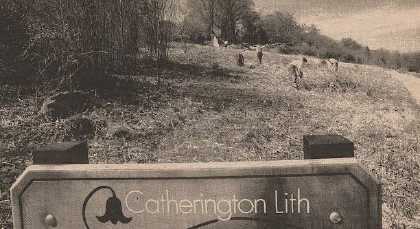 Catherington Lith Conservation Group was formed in 1990 and did conservation work at the Lith up to 2003 when it was reluctantly decided to close down. 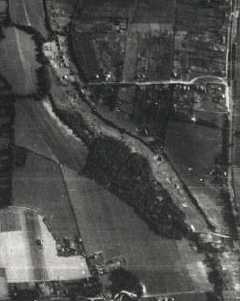 How the German Luftwaffe saw Catherington Lith in June 1943. The light area is Stubbins Down most of which has now grown into woodland, mostly Ash, maple and yew. Volunteers started clearing the southern end to restore some of the chalk downland, seen below making a start in March 1991. Area of broadleaved woodland, mainly beech and rich chalk grassland, home to many scarce plants, butterflies and the rare cheese snail. There is a small friendly conservation group welcoming newcomers to help clear scrub etc off this beautiful reserve. Mixed habitat - incl. Woodland, Grass/scrub, wetland. Between Morrisons supermarket and old A3, Horndean. Now a SINC - Site of Importance for Nature Conservation. 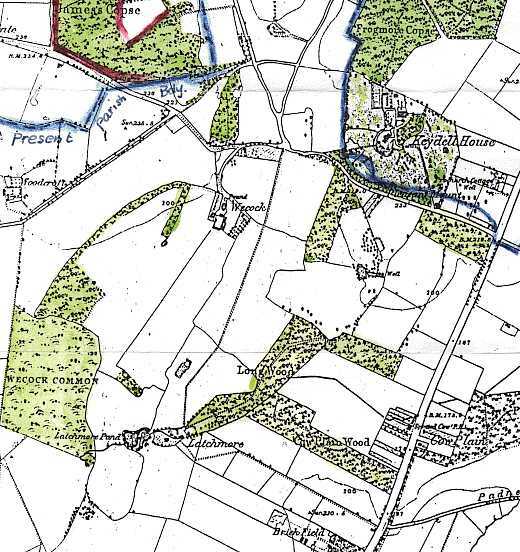 A large area of mixed woodland with good access to forestry tracks from the rural car park just off the B2149 road from Horndean to Havant near the 'Shell' garage roundabout 2 miles south-east of Horndean. The area is managed by Forest Enterprise with a design plan to "protect and enhance biodiversity, protect archaeological features and maintain sustainable timber production. This will increase permanant open space reduce conifers and increase broadland cover. Ref: Forest Design Plan and wildlife data collected by HWT, HOS and HBic. This project could be of benefit to wildlife. Interested parties were invited to provide an input at a Stakeholder Group set up in December 2004 and include representatives from the Wildlife Trust, (Denis Garratt) Hampshire Ornithological Group (John Goodspeed) and the Forestry Commission (David Williams) and all the local councils (EHDC, HCC, HBC, RCastle PC) and Staunton Country Park (Lewis Paterson). These pictures taken in November 2006 give a panarama view of the area, with the Upper Lake and strip of woodland running through the centre and the right hand picture the large open area to the west extending up to Bell's Copse. A large area of heathland, mixed scrub, wooded dells with ponds and wetland area, home to lizards, snakes, many species of dragonflies and others invertebrates, always something new to see. Spread of bracken in some areas, a few patches of heather survive, mostly mixed with extensive areas of gorse where there is a good breeding population of stonechats. 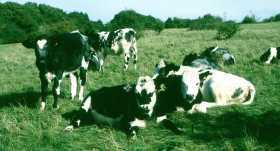 Area is grazed by cattle. Fact Sheets: Cards on local nature reserves and No.1 in the Series is Hazleton Common described as Horndean's little piece of heathland. Available free from HPC office. Includes a photo of one of the long horned cattle currently grazing the area. 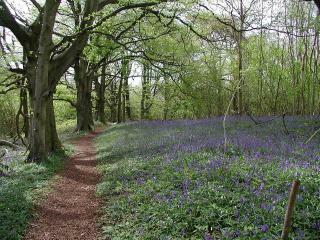 An area of mixed woodland with one good access path to the north of which is a larger area of bluebells. The Holt is entered via a path south of Pyle farm (MRef: 712123). There is a broadwalk extending between Horndean and Rowlands Castle, this is part of the Monarch's Way and was the escape route of Charles II after the Battle of Worcester in 1651 going along the South Downs to Shoreham and then to France. It is a pleasant was to walk between Horndean and Rowland's Castle, either in woodland or open country. The pictures show the path through the Holt on 12th May 2007 Red Admirals sunning themselves on 11th November 2006. Ancient woodland with dormice, surviving fragment with rich flora. This small area of woodland consists mainly of Oak, Yew, Field maple, with some hazel and other ornamental conifers, rhododendron etc and a ground flora where light can penetrate that contains pendulous sedge, primroses, ferns all covered with a considerable amount of litter including domestic rubbish, a burnt out car and several old bicycles. At the north end there is concrete and masonry mainly from the house that stood on the site. Havant Borough Council received a planning application No.04/56339/004 in October 2004, for the erection of a 3 storey building comprising 54 retirement flats with associated parking at basement level, vehicle and pedestrian access to Wesermarsch Close and a pedestrian access to Longwood Avenue. Application from Mapleford Estates, Clapham and the local agent are Richard Ashby Associates Ltd, Kemps Place Greatham, Liss, hants. GU33 6HG. The site is a haven for wildlife and surveys show 25 species of birds, 9 species of mammals including the presence of bats. Most important it contains a good number of mature native oaks between one and two hundred years old and forms a valuable link between nearby areas of ancient woodland. It forms a valuable wildlife habitat as well as a local amenity and an environmental asset in a largely built up area. More information is now on their excellent new website at www.bluebellwood.wesnetservices.co.uk/ with pages on history, fauna and flora and the Friends of the Bluebell Wood volunteers group. A beautiful area of ancient woodland with access footpaths from Little Hyden Lane (footpath from Clanfield school), or North Lane. A small volunteer conservation group works in the woods on the third Saturday each month, further information phone the contact for the monthly Bluebell Wood Newsletter. On the 19th July 2008 a butterfly walk was carried out around Lowton's Copse and Hyden Woods. A good number of butterflies were seen by the conservation volunteer group in the afternoon which was warm and sunny with a slight breeze. We also had a look at the new charcoal burning area. 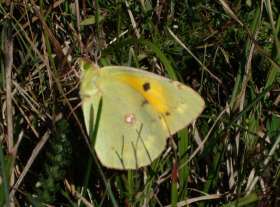 There were a few Brimstones (1) which were most likely 2nd generation, and Silver-washed Fritillaries (2), also a single Comma butterfly (3) and some Large Whites (4) this one resting in the grass. Other butterflies seen were Meadow Browns, Marbled Whites, Large and small Skippers and one sighting of a Purple Emperor that travelled away too quickly to get a picture for the record ! The pond is now urgently needing volunteers to help with maintenance. Woodland and chalk grassland being re-created. The Earthwork's Trust Sustainability Centre still needs volunteers to help conserve 50 acres of woodland and chalk downland. 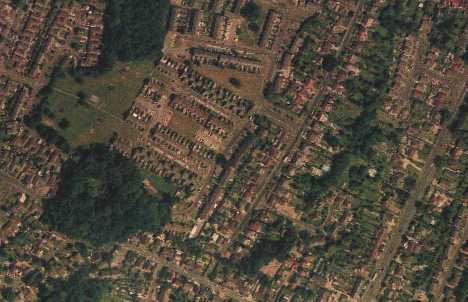 A remnant of the ancient Forest of Bere - a rare green oasis in an essentially suburban environment. Details and the latest information can be found on their excellent web site at www.park-wood.org.uk. 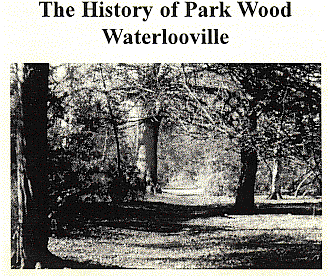 The Friends have produced a book describing the story of the woodland from earliest times to the present, containing many maps, old photographs and much detailed research. Fascinating reading and well recommended. Volunteer Work days Next on Sun 20 May and on the following Wed evening at 6.30 there will be a walk in the woods (Details on South Down Group page and on the Park Wood website). The date has now been fixed to hold the Woodland Festival at Park Wood on 30th September 2007. We invite all Tree Wardens to a special meeting On Wednesday evening 16th January 2008 in Cowplain when Jon Stokes will be coming to talk about the Old Veterans and many of the old treesin East Hampshire will be shown on the screen.We hope that a number of local people will join us for the search for local ancient or unusual trees. Further information can be found on the Hampshire Wildlife Trust South Down Group page. Our local fragment of the former Royal Forest of Bere, probably named after Queen Victoria, contains many large sessile oaks, some nearly 200 years old. Volunteer tasks include pond management and path restoration. Western extremity of Stansted Forest. Woodland, mainly beech and meadowland with wetland dell, mostly overgrown. A small group formed in June 1999. Volunteers needed for conservation work and wardening. Woodsedge Waders - Workdays on 2nd Sunday in the month 10am to 12noon. A precious fragment of Ancient Woodland with a small wetland area on the north side and now surrounded on three sides by housing development. 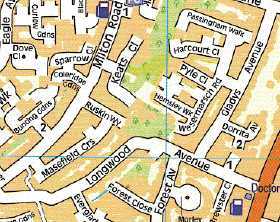 A Fact Finder Card on Yoell's Copse is available from Horndean Parish Council.